When I connect my new Duetx2, I have this continuous message "Error: Short-to-ground on drivers 5 6. Error: Over temperature shutdown on drivers 5 6", There's no stepper motor connected to the duetx2, just the bltouch. Just my 2 Cent: Have you remapped the Heaters for use of BLTouch? First you need to allocate an unused heater expansion channel to reconfigure as the servo control for the BLTouch. For example, if the E3Heat output is unused, you can use heater 4 which corresponds to the PWM2 connector. 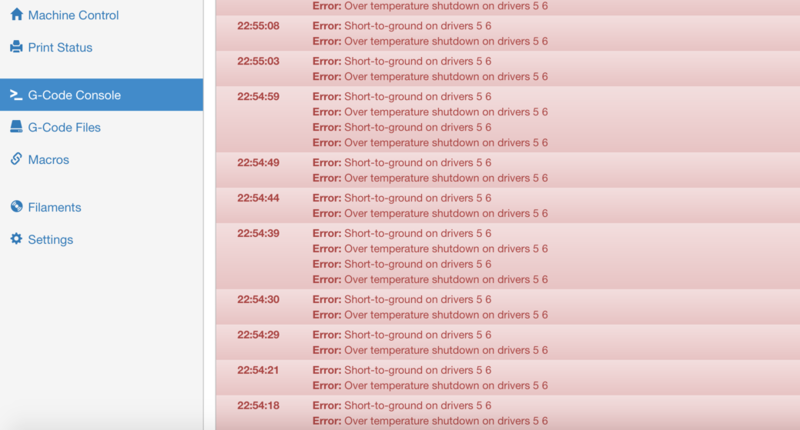 but I have this message every 5 seconds ""Error: Short-to-ground on drivers 5 6. Error: Over temperature shutdown on drivers 5 6"
Additional you define No offset in X/Y for BLtouch which isn't possible. One side note: Do you use a Resistor or have you cut the Traces for your BLTouch (depends on the Model)? For the BLTouch the trace was cut (it's a BLTouch smart), but I have the same message "Error: Short-to-ground on drivers 5 6. Error: Over temperature shutdown on drivers 5 6"
Can you post a Picture of the DuetX2 and the Wiring of BLTouch? Additional, how you have wired VIN / GND to the DuetX2? That error message suggests to me that either you have 2 blown stepper drivers on the DueX2 (unlikely), or you have mounted the DueX2 too close above a metal plate so the back of the board is shorting against the plate, or there is a fault in either the Duet or the DueX2 that is preventing the drivers on the DueX2 returning their status information. Are the stepper drivers on the DueX2 getting hot? No the steer drivers on the DueX2 are cold, the DueX2 is mounted on pla printed box without any metal screws , I make some tests, after removing all on Duetwifi ( steper motor, heater, switch, fan, sd card ),the message is displayed just with the main power ( 24v) turned on. Hi everyone, thank you for your comments, I found the problem, I just replaced the GND cable of the Due2x.